A Connemara based milliner is drawing on the elegant styles of the 1920s to the 1950s to find inspiration for her hats. Isobel Marinot-Wood has been busily making a name for herself in the highly competitive world of ladies headwear. With a background in jewellery and goldsmithing, her signature style is strongly influenced by the use of textures and she is passionate about using high quality components in her creations, from felts and wools to silk and tweed, feathers and plumes. Her creations are handmade in Ireland. "They are comfortable and are incredibly easy to wear," she says. "The birdcage design is very popular at the moment and veiling is always so elegant. The pheasant feather embellishment which I use sometimes gives that little bit of country quirkiness, which is the signature base to all Marinot Millinery designs." Isobel is particularly inspired by the natural world and draws inspiration from the flora and fauna of Irish country life and worldwide travel. Having been brought up in Kildare, with an "outdoorsy" childhood, of hunting, shooting and fishing, this is reflected in her designs. All her hats and head pieces are made by hand, and each is unique. While she does not follow any particular new fashion or colour trends, she believes that the elegant styles of the 1920s to the 1950s come through quite strongly in her designs. There is also a touch of modern quirkiness. Comfort is an important aspect. Her hats range from bridal pieces to racing, to everyday wear. There’s a hat to suit everyone, depending on personality, colouring, face shape, etc. Having taken stands at some of Ireland’s most popular race meetings in the past few years, her following is growing steadily. Recent features on TV3's Xpose, RTE's Nationwide and Galway Races television coverage, as well as in local, national and online media have confirmed Isobel's position as a rising star in the world of Irish millinery. Isobel also takes a stand at the Punchestown Racing Festival each year. Marinot Millinery's hats and headpieces are made to order and currently available directly from Isobel, from Millars in Clifden, and she regularly has pieces on sale at The Galway Hat Shop. She takes stands at Punchestown Races and the RDS Craft and Design Fair. She has also begun making feather lampshades, to order, moving slightly from fashion to interiors. "My clients would normally make an appointment for a consultation, either at my studio in Connemara, or I would go to meet them. After that we would liaise with photos via email, etc. Most hats are made to order, one off pieces." 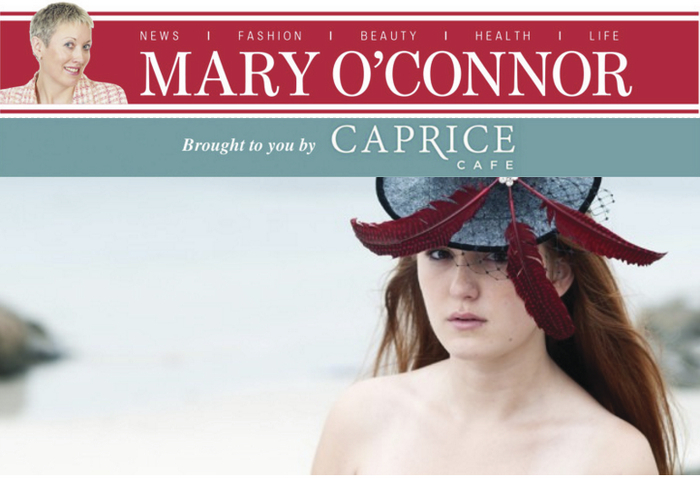 For further information, or to make an appointment for a consultation contact [email protected] or call (087 ) 2690806 or log on to www.marinotmillinery.com The prices of her designs vary, the ones featured in this article range from €200 to €250.